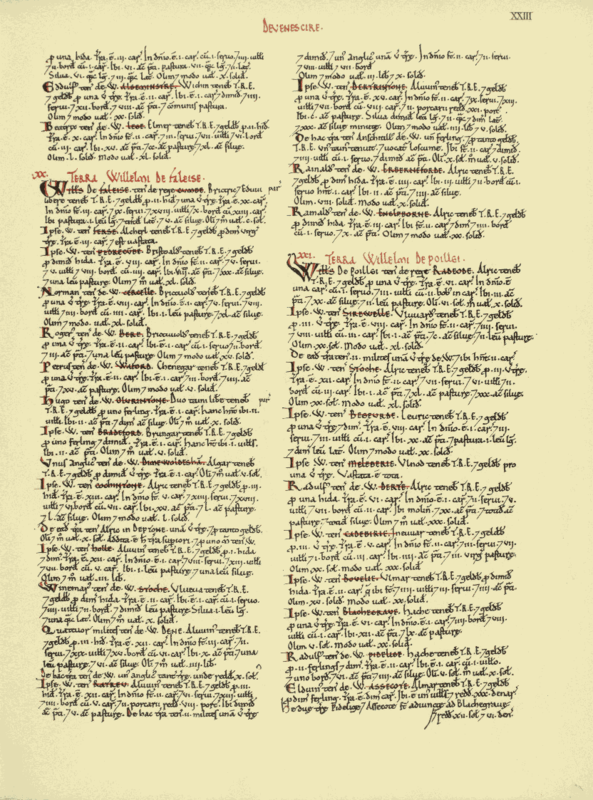 The Domesday Book is a great land survey from 1086, commissioned by William the Conqueror to assess the extent of the land and resources being owned in England at the time and to determine the extent of the taxes he could raise. The information collected was recorded by hand in two huge books, in the space of around a year. William died before it was fully completed. The grand and comprehensive scale on which the Domesday survey took place, and the irreversible nature of the information collected led people to compare it to the Bible description of The Last Judgement, or ‘Doomsday’, when the deeds of Christians written in the Book of Life were to be placed before God for judgement. This name was not adopted until the late 12th Century. The Domesday Book provides extensive records of landholders, their tenants, the amount of land they owned, how many people occupied the land (villagers, smallholders, free men, slaves, etc. ), the amounts of woodland, meadow, animals, fish and ploughs on the land (if there were any) and other resources, any buildings present (churches, castles, mills, salthouses, etc. ), and the whole purpose of the survey – the value of the land and its assets, before the Norman Conquest, after it, and at the time of Domesday. Some entries also chronicle disputes over who held land, some mention customary dues that had to be paid to the king, and entries for major towns include records of traders and number of houses. Parracombe is recorded in the book as Pedrecumbe. After the Norman Conquest it passed from Beorhtwald to William of Falaise and it is likely that he built Holwell Castle, the motte and bailey castle which controls the Heddon valley. Hundreds are administrative subdivisions of counties. Counties in Domesday are broadly similar to those of today – except for Lancashire, which didn’t exist! Sometimes places are listed under multiple counties. Relative to other Domesday settlements, Parracombe had a medium population. Population is counted in heads of families, so the real population was probably up to five times larger. Relative to other Domesday settlements, Parracombe paid a very small amount of tax. The total tax assessed on each property. Domesday is all about tax! This field shows the tax assessment for the manor. Value of this manor. This field shows how much the manorial lord received from the villagers in rents etc. Households: 5 villagers. 8 smallholders. 5 slaves. Population in 1086 – households, rather than individuals. Villagers have the most land, followed by smallholders, then cottagers. Ploughland: 8 ploughlands (land for). 2 lord’s plough teams. 4 men’s plough teams. The amount of ploughland, and the number of ploughteams working on it. Each ploughteam has 8 oxen. Other resources: 0.25 lord’s lands. Meadow 8 acres. Pasture 1 leagues. Woodland 30 acres. Other resources, such as meadow, woodland, mills or salthouses. Measured according to the tax due on each – tax on woodland is often paid in pigs! Livestock in 1086: 10 cattle. 27 sheep. 27 goats. Lord of the estate in 1066: the man or woman who received the profits from the holding. Lord in 1086: William of Falaise. The new owner after the Conquest. This is the immediate lord over the peasants in 1086: it may be the tenant-in-chief himself, or a tenant to whom he had granted the estate. Tenant-in-chief in 1086: William of Falaise. Tenant-in-chief of the estate in 1086: holding directly of the Crown. Section number in the Phillimore edition of Domesday Book.